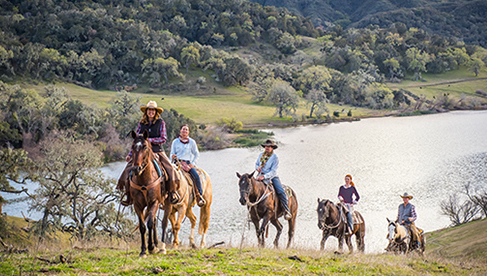 De-stress from the holidays with horses, mountain views and winter fun at a guest ranch. If the post-holiday doldrums have you wishing for secluded, cozy log cabins and hearty home-cooked food, it’s a great time to plan a winter ranch vacation. Winter is just beginning, so there is plenty of time to get out and embrace the season with snowy adventures – followed of course by wood fires, warm beverages and hot tubs to ease chilled muscles. 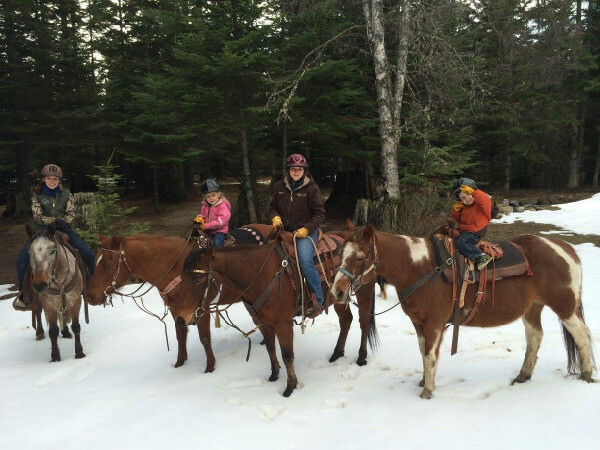 Take a snowy winter ride at Western Pleasure Guest Ranch. Photo by Danielle Otis. 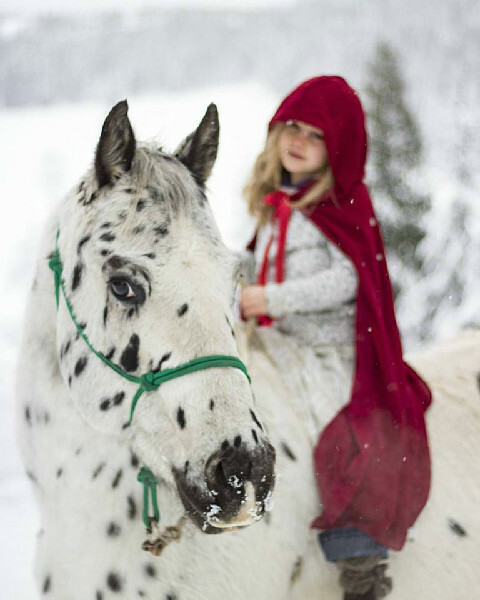 Whether you’re seeking sleigh rides or trail rides, swooshing down slopes or cross-country skiing, or just some reading time in a toasty bed surrounded by silvery mountain scenery, guest ranches offer unique winter wonderland vacations. From snowmobile escapades to a snowshoe jaunt through quiet, frosty woods, find a ranch that’s just right for your winter splendor desires. 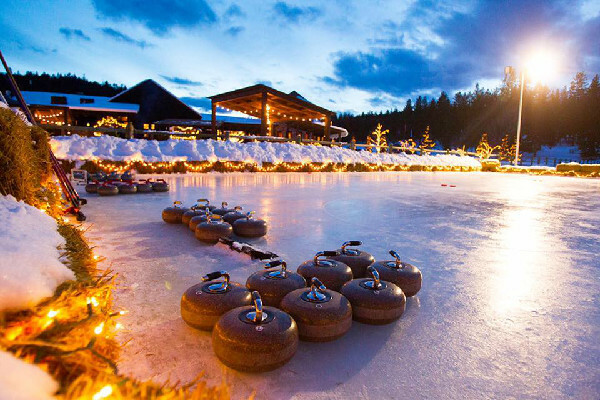 Ice skate outside or try the sport of curling during WinterFest at the Resort at Paws Up. Diverse winter adventure opportunities abound at the Resort at Paws Up, such as dog sledding, outdoor ice skating, and miles of trails for snowmobiling or cross-country skiing. Downhill skiing and snowboarding are available at Snowbowl, just 45 minutes away. The resort has also jumped into the new trend of skijoring, a Nordic sport in which the skier is pulled by horses or dogs. WinterFest, a winter food and wine festival, is planned for January 19-22, 2017, and it will have the chefs putting on a culinary show. Guests can also enjoy winter trail rides, sleigh rides, a curling competition, tubing and snowshoeing. 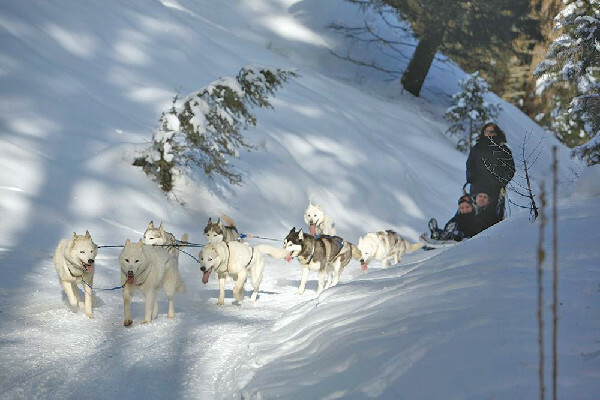 Experience the rush of riding behind dogs as they gallop through the powder snow. Miles of trails are available for snowy trail rides, cross-country skiing, guided hikes and snowshoeing through the Medicine Bow National Forest near the Vee Bar Guest Ranch. Ski packages offer alpine skiing and snowboarding at the neighboring Snowy Range Ski and Recreation Area. Riverside cabins provide privacy, and horse-drawn wagon rides include hot chocolate or warm cider. Stargaze from the outdoor hot tub, or enjoy billiards and games at the John Wayne Saloon. 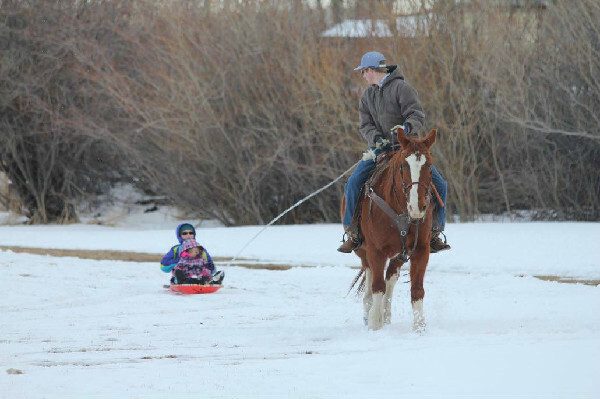 All manner of winter fun, including sledding behind a cantering horse, is available at guest ranches like Vee Bar. A great choice for families, Rocking Horse Ranch Resort offers an outdoor ice rink and mountain tubing with chute lanes and a conveyor lift. Onsite downhill skiing instruction includes equipment, a convenient package for beginners and kids on the bunny hill for the first time. A spa, arcade and indoor water park await those who’d rather enjoy the winter inside. 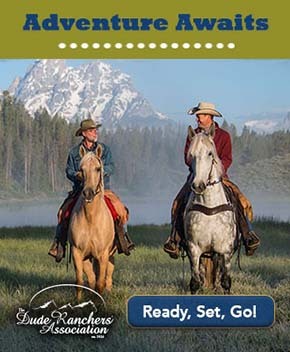 Trail rides are managed by CHA-certified riding instructors and divided by skill level, with pony rides available for the youngest family members. The ranch has 500 wooded acres to explore. Horsey opportunities are plentiful, such as wagon rides, sleigh rides, horseshoeing demonstrations and barn tours. 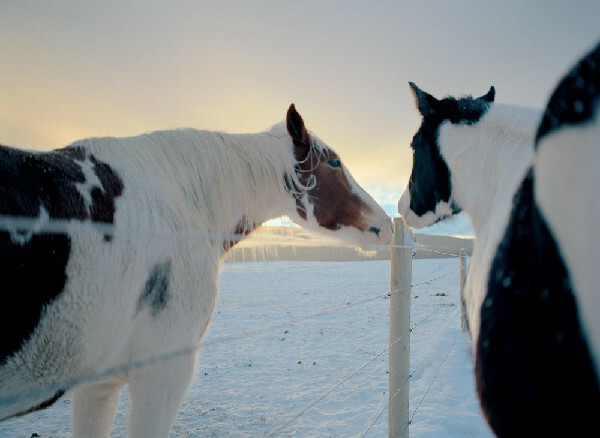 Horses, snow and mountains combine for beautiful views during winter ranch vacations. If a high Rocky Mountain getaway is your style, Coulter Lake Guest Ranch is situated at 8,100 feet in the White River National Forest. Choose from several sizes of private cabins, and enjoy gourmet meals with gorgeous snowy views of the lake and mountains. Horses leave the mountain for greener pastures during the winter months, but extensive remote snowmobiling trails are available, with rental sleds and guided tours offered as well. Ice skating, sledding, snowshoeing, snow forts and cross-country skiing await. 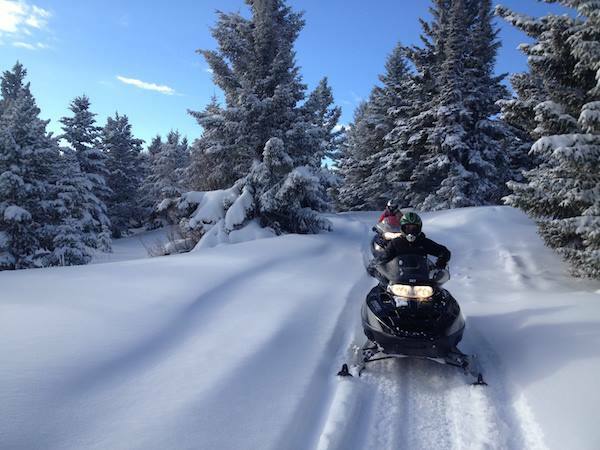 Guests even arrive by snowmobile into the ranch during the winter, beginning the adventure in alpine style. Experience remote winter trails at high speed on a snowmobiling adventure at the Resort at Paws Up. Private sleigh rides, log cabins, country hospitality, and snowshoeing through Northern Idaho powder are on hand at Western Pleasure Guest Ranch. Packages offer abundant downhill skiing and snowboarding at the Schweitzer Ski Resort in the nearby Selkirk Mountains, with views of Canada and two states. Winter packages also include cross-country skiing, fat bike, snowmobiling, or spa options. Take a trail ride through quiet woods. Photo courtesy Western Pleasure Guest Ranch. From dog sledding to snowmobiling, ice fishing, sleigh rides, backcountry skiing, ice skating and snowshoeing, the Bar W Guest Ranch offers a wide variety of winter fun. Cross-country trails are lighted for night skiing at the Glacier Nordic Center nearby. Downhill skiing and snowboarding are available at the Whitefish Mountain Resort just 12 miles away, and the magnificent views at Glacier National Park are just 23 miles away. 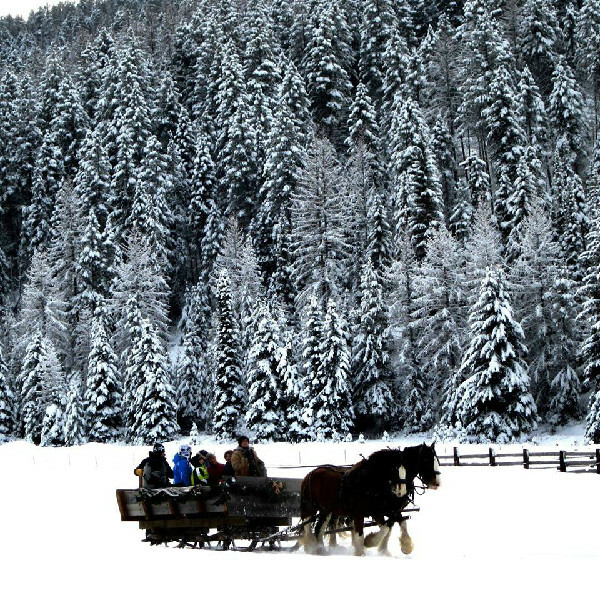 Enjoy a sleigh ride with a mountain view at the Bar W Guest Ranch. Sledding, ice skating, snowshoeing, and classic Vermont winter fun is right outside the lodge door at Mountain Top Inn & Resort. Riding is closed for the winter, but equine fans will appreciate the horse-drawn sleighs while enjoying views of the lake and the Green Mountains. The Nordic ski center has been in operation for over 50 years, so it’s an ideal place to try the sport or perfect your technique. Surrounded by vast trails for snowmobiling, visitors can choose from guided tours or explore on their own. A free daily shuttle takes guests to Killington Resort for downhill skiing, snowboarding, fat bikes, gondola rides and tubing. Karen Braschayko is a freelance writer and horse lover who lives in Michigan.